And yet, on the challenge of reducing food waste, there is a huge expectation from the top leaders that collaboration holds the key to unlocking drastic food waste reduction. 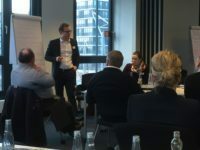 To better understand the true state of collaboration today, and to identify what it would take to improve collaboration, a group of 40 food waste experts from retailers, fresh suppliers and academics met in Hamburg to discuss for a round table discussion on this topic of collaboration. Collaborate with suppliers and share the benefits of joint initiatives to reduce waste fairly. Jane then facilitated round table discussions on the barriers to great collaboration drawing out key insights from the attendees on what is getting in the way. Professor Sandra Transchel of KLU logistics University, then introduced the concept of Maturity models, highlighting that they serve two main purposes. First, they act as a practical tool that can help collaborative partners align on the current state of their collaborative relationship across several dimensions. This can help retailer and supplier partnerships identify how, should they choose, they could advance their collaboration to the next level and what that different stage looks like. Secondly, they can be a tool for individual organisations to self- assess their current relationships with their partners. To get started on defining what a maturity model for food waste collaboration could look like, Sandra facilitated a round table discussion to identify the key dimensions most relevant to the measurement of a collaborative relationship. The groups feedback was shared and noted. The next step for the ECR Community Shrink & OSA Group is to turn this feedback and thinking into a draft maturity model and to then get feedback on its relevance and practicality for the industry.